In New Mexico on the morning of Aug. 18, a high-altitude balloon successfully carried the LASP-built HyperSpectral Imager for Climate Science (HySICS) instrument to an altitude of 123,000 feet, above most of the Earth’s atmosphere, to reach space-like conditions and demonstrate new technologies for acquiring high-accuracy science measurements of the Earth. NASA’s Earth-observing satellites have long collected radiance measurements of the Earth. But recent technology advances could lead to future measurements with higher levels of accuracy than what is currently available to researchers. These next generation data would enable clear climate change detections in years instead of decades, thus allowing more timely and accurate climate trend detection. To provide the instrumentation capable of such high-accuracy measurements, NASA’s Earth Science Technology Office funded LASP Senior Research Scientist Greg Kopp to develop HySICS, an instrument able to make ultraviolet-to-infrared radiance measurements of the Earth. The instrument’s spectral range, spanning 350 to 2300 nm in wavelength, is critical as it covers most of the sun’s emitted energy. The high-accuracy data HySICS collects could give insight into how much of the sun’s radiative energy is reflected by the Earth’s surface and atmosphere, an important component for climate research. HySICS’ first flight took place on Sept. 29, 2013, from the Columbia Scientific Balloon Facility in Fort Sumner, New Mexico. That engineering flight gave Kopp and his team flight experience and data necessary to refine the instrument in preparation for this month’s science demonstration flight, also from Fort Sumner. After a successful mid-morning lift-off and reaching an altitude high enough to provide the imager with nearly a 7-kilometer field of view of the ground, HySICS collected science data and self-calibrated by periodically taking radiance measurements of the sun and moon. The calibration against the sun’s known emitted energy provides the instrument with a reference point that allows it to collect such high-accuracy data of the Earth. The precision pointing that is critical to calibrations using HySICS’ three differing targets—the Earth, sun, and moon—during one short flight was made possible by the Wallops Arc Second Pointer (WASP), a balloon-based tool originally developed for planetary scientists to aim their instruments at distant items of interest. WASP, developed at NASA’s Wallops Flight Facility in Virginia, took its first balloon test flight in 2011 and another engineering flight in 2012. After extensive testing, WASP was partnered with its first science instrument, HySICS, for the radiance instrument’s inaugural engineering flight. From liftoff to landing, HySICS and WASP were airborne for nearly nine hours. 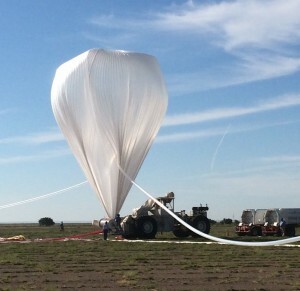 When the team had collected enough data to test the accuracy of the instrument, the balloon payload was separated from the balloon itself and was safely carried back to the ground via parachutes, landing between two threatening thunderstorms. The payload landed east of Holbrook, Arizona. The flight was deemed both an operational and science success. The HySICS team was able to collect high-quality radiance measurements throughout the flight and has now returned the instrument to Boulder to process and analyze the on-board data. When this analysis is completed, the HySICS team will learn if they have reached their goal of collecting the most accurate shortwave radiance measurements ever taken of the Earth – an important milestone for future technology developments and the researchers who could someday incorporate such data to create more reliable climate models.